Yesterday (January 8) was Yash's birthday and his fan waited to see the actor in front of his house at Kathriguppe in Bengaluru, despite the announcement that Yash will not be celebrating his birthday this year. Bengaluru: KGF star Yash's fan who set himself ablaze in front of the actor's house yesterday breathed his last in Victoria hospital. The fan has been identified as 26-year-old Ravi, a resident of Laggere in Bengaluru. Upon hearing the news, Yash visited the fan in the hospital. Yesterday (January 8) was Yash's birthday and Ravi waited to see Yash in front of his house at Kathriguppe in Bengaluru. But Yash decided not to celebrate his birthday as a mark of respect to actor Ambareesh, who passed away on November 24. Ravi was an ardent fan on Yash and used to wish the star in front his house every year. The news that Yash was not celebrating his birthday saddened Ravi. Despite Yash's plea to his fans not to gather in front of his house, he was waiting for a glimpse of the star. But Yash had gone out with his family. Yash decided not to celebrate his birthday stating, "There is a time for celebration and then there is a time for remembrance and reflection. This year is for the latter." ನಾನು ಖುಷಿಯಿಂದ ಎಲ್ಲರೊಡನೆ ಸಂಭ್ರಮಿಸಲು ಒಂದು ಸಮಯ. ನನ್ನ ನೆನಪುಗಳ ಪುಟ ತಿರುಗಿಸಲು ಈ ಸಮಯ. 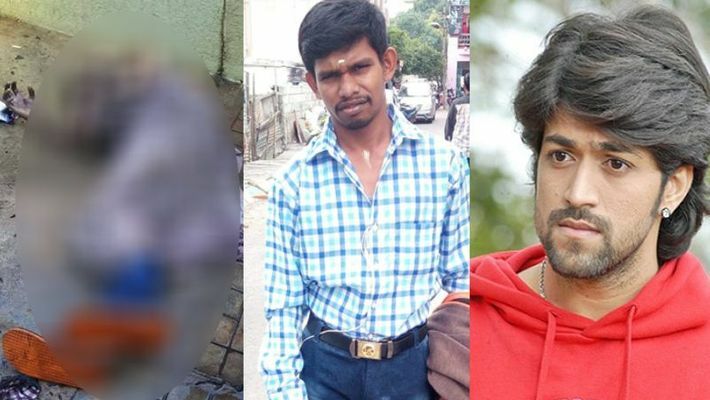 Ravi waited until afternoon, but as he could not catch a glimpse of Yash, he doused his body with petrol and set himself ablaze in front of the actor's house. The police deployed at Yash's house for security tried to put out the fire and admitted him to hospital. Ravi suffered 80% burns and was put in the intensive care unit. Ravi did not respond to the treatment and died in the wee hours of Wednesday. A case in this regard has been registered at Girinagar police station. Ravi hailed from Pavagada taluk in Tumakuru district, Karnataka and was a resident of Laggere along with his parents for over a decade. He was a carpenter. Devotees walk through a pool of fire, risking many lives in the name of god!